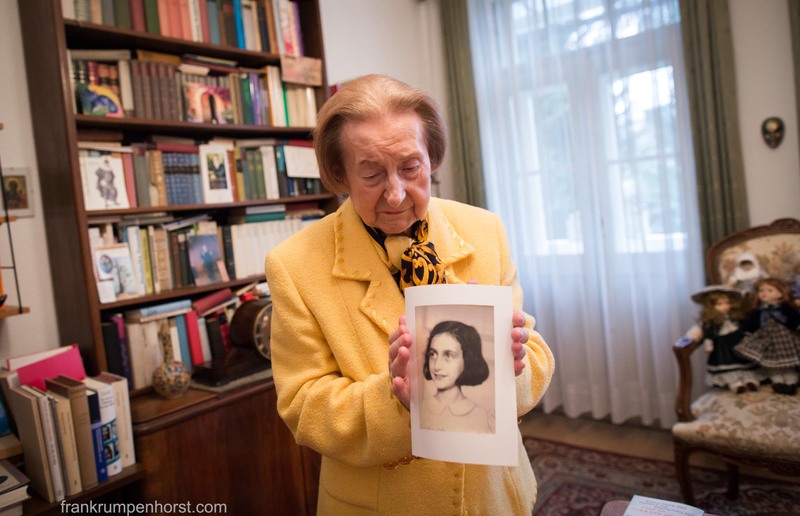 Ingeborg Strauß (a very friendly and open minded lady), aged 84, holds a photo of Anne Frank while standing in the living room of her appartment at Marbachweg in Frankfurt (Feb.19), the very same appartment where Anne Frank was born on June 12, 1929. Anne spent the first two years of her life here. Over the last decades, Ingeborg Strauß has shown her place to many visitors from all over the world. A lot of things are left unchanged since the 1930s, like windows, doors, tiles and the bathtub. The Franks eventually left Frankfurt in 1933 after the Nazis gained control over the country. In Amsterdam, they were trapped when the Germans occupied the Netherlands. The family was forced into hiding for two years during which time Anne Frank wrote her famous wartime diary (The Diary of a Young Girl) that was published posthumously. Anne died in 1945 at a concentration camp just two months before the end of the war in Europe. Her family and other members of the group in hiding had been betrayed. This entry was posted in germanx, history, holocaust, Photo, Photography and tagged anne frank, birthplace, das tagebuch der anne frank, diary of a young girl, Frankfurt, marbachweg. Bookmark the permalink.